Late last month federal prosecutors and Immigration and Customs Enforcement (ICE) filed 19 indictments against individuals involved in the birth tourism business, those facilitating and profiting from the practice of some wealthy aliens, mostly Chinese, giving birth within the United States, and thus creating instant citizenship for the baby. The participants were charged with a wide variety of violations, including immigration fraud, money laundering, and cheating on U.S. income-tax returns, according to a press release from ICE. As far as I could determine, none of the mothers were charged with the act of giving birth, but many of them, and their husbands, were indicted for related matters, such as lying to government officials, not paying their hospital bills, and fleeing the country rather than facing court actions. There was also no indication that the births of the infants would lead to any attempts to deny citizenship to the infants. It was meant to send a message and to be a symbol, much like the Wall. It was the first major Trump administration move against a privileged migrant population, unlike other steps taken against powerless aliens, like Central Americans, refugees, would-be border-crossers, and the like. Birth tourism is expensive, with a cost range of $40,000-$80,000 mentioned in the release. It looked like a Capone-jailed-for-income-tax-violations maneuver, in the sense that the main activity of concern (giving birth in the United States) is not directly addressed, while ancillary actions were addressed. Interestingly, only three indictments, all for Californians with Chinese names, led to arrests; the other 16 "fugitive defendants" appear to be back in China. The three were the programs' operators, one of whom, Dongyuan Li, faced the seizure of her "$2.1 million residence in Irving [Calif.], six vehicles including four Mercedes Benz vehicles, more than $1 million from bank accounts and many gold bars and coins" according to the ICE press release. She is said to have "received $3 million in international wire transfers from China in just two years." Hers was one of three similar operations. There was an unstated, back-handed compliment in the release about the strictness of the officials at LAX. In one example, a heavy-with-child woman, traveling on a tourist visa, had been instructed to fly to Las Vegas, rather than directly to LAX, and others had been told to enter the United States in Hawaii, rather than in Los Angeles. In both cases the advice was to avoid LAX. A Pound of Cure. While I am pleased that DHS finally took these steps, I must say that this was an expensive approach to the problem in terms of investigators' and lawyers' time, and moneys spent. DHS should start turning away such women at the ports, causing the airlines to pay for the women's return flights; the airlines would scream to high heaven, but would start to do their own screening on pregnant women with tourist visas, which we suspect would be a highly effective, non-governmental screening process. On that last point, a few years ago Air India started denying passage to departing students heading for two or three named California visa mills, as we and the Indian press reported at the time. The airline feared it would have to fly the "students" home at the airline's expense. 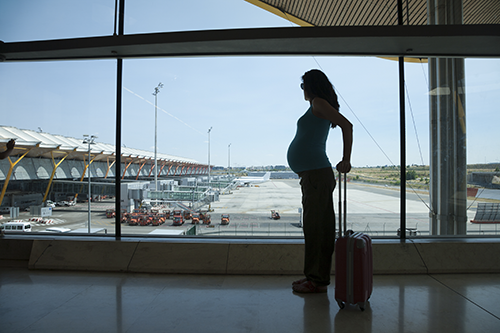 For a scholarly examination of the birth tourism issue, see "The Birth Tourism Industry Continues to Grow", by my former CIS colleague, Jon Feere.